Doctor Who originally ran from 1963 to 1989. Classic Who, as it’s known, is very different from the rebooted version that made its debut in 2005. Potential viewers need not worry that they have all those seasons (or series, as they say in the UK) to catch up on; there are a number of different starting points to break into the show. More on that in a bit. 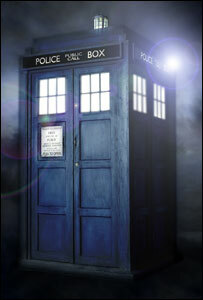 He travels around time and space in a time machine called the TARDIS (Time and Relative Dimension in Space). The TARDIS is supposed to change its outer appearance to blend into its surroundings, but it’s faulty and so looks permanently like a 1960s London police box. Also, it’s bigger on the inside. The Doctor can usually be found with a young, female companion at his side. Together they have adventures and fight monsters. They also deal with real-world issues like loyalty, friendship, life and death, love, and loneliness. The rebooted version begins after a time war between Time Lords and an alien race called the Daleks. The Daleks are aliens that hail from Classic Who. They’re supposed to be scary, but they’re really just ridiculous. Anyway, at the end of this massive war, the Doctor is alive, the last of his kind. One other key bit of information: when a Time Lord is dying, his body regenerates. This doesn’t mean that Time Lords can’t die at all. They can. I just said as much in the previous paragraph, weren’t you paying attention? But if all goes well, he (or, as the case may be, she) gets a new body, new personality, but keeps the same memories. This has allowed multiple actors to play the role. There are currently eleven variations of the Doctor, the latest of whom is played by Matt Smith (who also happens to be the youngest actor to portray the icon). Each regeneration also changes the tone of the show, so that it almost feels like a completely different show. My personal opinion? Either series two or five. Here’s why: while Classic Who adds to the culture of Doctor Who, it doesn’t have much of a bearing on the current show. The monsters aren’t as scary, the special effects aren’t as cool, and to be honest, it’s simply not as snazzy as the modern one is. The reason I say to skip season one of the reboot is because I’m not a fan of Eccleston’s version of the Doctor. He tries to be funny, but he just looks mean. The dialogue doesn’t match the person, and it just seems wrong. Also, the monsters and aliens are weirdest in this season. Recommended episodes of series one: Episode 1 (Rose), Episodes 9 and 10 (The Empty Child and The Doctor Dances) and Episodes 12 and 13 (Bad Wolf and The Parting of Ways). These introduce important characters and plot points that are seen again in future episodes. Whovians have their favorite Doctor, what they call their Doctor. My Doctor is Eleven (Matt Smith’s), but Ten (David Tennant’s) is right up there next to him. Doctor Who is funny, scary, complex, and dramatic. Sometimes it feels more like a movie than a show. It’s definitely very different from any other show on TV. If you don’t love it at first, persevere, because you might wake up one day and realize you’re obsessed. And it’s the best feeling in the world. PS If you’re already a fan of Doctor Who, check out my Doctor Who Appreciation lens – it’s full of Doctor Who related clips, games, hangouts, and more! I got started with Eccleston, and Tennant is my doctor. I do want to catch up on some random original classics, sometimes that old school cheesy stuff is a lot of fun. I was just thinking, do you think Doctor Who is a little like Star Trek where you don’t have to have seen the original series to appreciate the next generation, but it doesn’t hurt to have seen some original episodes? In any case, I would agree with you. It’s not necessary to watch Classic Who, but if you have the time, go for it! I think you can learn a lot about the Doctor from some of the old episodes, since the reboot is kind of a continuation of the older series. I can’t say for sure, though, since I haven’t watched any whole episodes. lol, the new-new STar Trek movie is a whole ‘nother animal. It’s fun of course and a great SF movie, and the Leonard Nimoy bits are fab, but it’s far removed from the old school Shatner stuff. but the original series Star Trek is a little bit like the original Doctor Who, i imagine – super low budget special effects, horrible aliens, a little sillier than the newer stuff. if you get a chance, watch a few original episodes, and it’s easy to catch a handful of “next generation”, they show the reruns of that on BBCAmerica, and maybe Syfy and a few of the other cable networks. I have loved it since I saw The Time Warrior take off his helmet. I’ve never seen the classic series (just clips here and there) – are you referring to the sontaran in The Time Warrior episodes? Yes. Lynx, I think. It is my earliest memory of television. “My” Doctor is Tom Baker, and I recommend “The Talons of Weng Chiang”, “Image of the Fendahl” and “The Ark in Space” for forays into Classic Who. Try and imagine the monster made from CGI rather than from bubble-wrap. Or notice that it is bubble-wrap, and continue to suspend disbelief: the transformation scenes in Ark still live with me. On new Who, I think series four weak, but Silence in the Library a good introduction to series five and six. So, start with series one and skip series four apart from that. Thanks for the advice re: Classic Who – if/when I go back and watch some, I’ll be sure to check out those you mentioned. As for new Who, I’m curious why you think series four is weak. Personally, I love Donna as the Doctor’s companion (which is funny, since I hated her in her first appearance back in the Christmas special). And yes, Silence in the Library is definitely a must-see regardless.